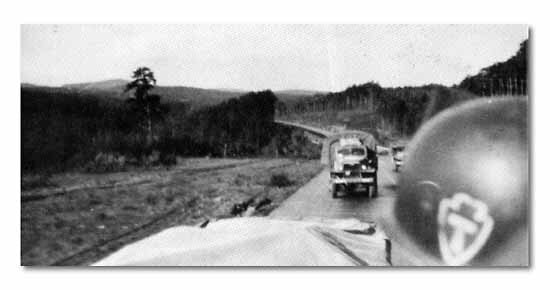 Division vehicles speed over German autobahns. Fine roadways were used by enemy jet planes. 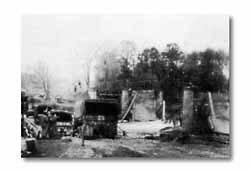 On April 24 Division elements left the Kaiserslautern area, traveling 150 miles to an assembly area east of Heilbronn, preparatory to re-entering the swift-moving Seventh Army line. Before the Division could collect its many units in the assembly area, the Army line had moved more than miles beyond. When the 12th Armored Division seized a bridge over the Danube, the whole structure of German resistance crumbled. After being attached to the 21st Corps, the 36th caught up with and relieved the 63rd Division at Landsberg, some 300 miles from Kaiserslautern. Following and mopping up behind the fast-moving 12th Armored, a combat technique both novel and pleasant to the 36th, the Texans initiated an attack to the south from Landsberg. Wertheim was cleared by the 2nd Battalion, 141st Infantry, which continued to move on into Penzberg. This was rampaging warfare. Resistence stiffened only sporadically, but for units who sped forward there was ever imminent the threat of ambush by fanatical storm troopers. Moving eastward, the 141st Infantry captured Bad ToIz, engaging German stragglers fleeing into the Alpine retreat, while the 142nd swept the woods to the east and west of Murnau in the direction of Garmisch-Partenkirchen, site of the 1936 Winter Olympic games. At this time the 143rd assumed the police and patrol of the Murnau-Issingen area. 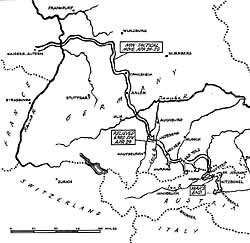 When the 36th moved from Kaiserlautern to rejoin Seventh Army, it took three jumps and five days to catch the rapidly advancing Army line. Six days later, in Austria, final victory came. Click on map to view larger image. Attacking south from Bad ToIz, the 141st mounted the high Bavarian slopes to capture Tegernsee, Hohenburg, Lendgries and Wolligan. Huge snowdrifts in the mountain passes slowed the movement, but on the morning of the 5th the 141st cleared the last obstacle and entered the Inn River Valley. Late in April the 36th crossed the Rhine near Frankenthal. Broken railroad bridge paralled pontoon span. 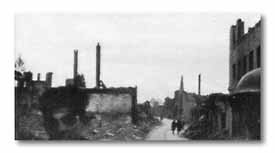 (Below) Crailsheim's pulverized buildings were left behind. 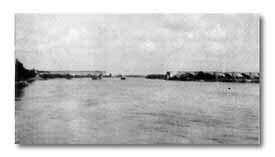 The Blue Danube was muddy and green where 36th crossed it, following up the Seventh Army advance.